Layering is all about pairing different types of clothes together to create one cozy, bundled up, thrown together look that seems effortless. Fall is the perfect season for layering because it’s usually cooler in the morning with temps rising in the afternoon. Lucky for me, it stayed consistently cold while we were in the mountains. Nothing makes me happier than having a reason to bust out the beanies and cozy wraps! Love to you all! Have a great weekend! So much respect for you and your hubby and his service. Thank you both! I love your fall style. I remember a few of your outfits from last year and you just rock it! Your wrap coat is a pure dream dear! You look fabulous in winter coat, Shauna! I also adore your bag and hat. Great styling as always!Thanks for sharing! so sweet! and how honorable! you always look so well put together! Oh my beautiful friend!! Such a gorgeous look, I need your wrap coat! Happy Veterans Day to your husband and thank him for his service! Oh wow, I never knew that about your husband! Happy Veterans Day to him, and please thank him for his service! Tis the season to start bundling up! I love your chic layers, girlfriend! 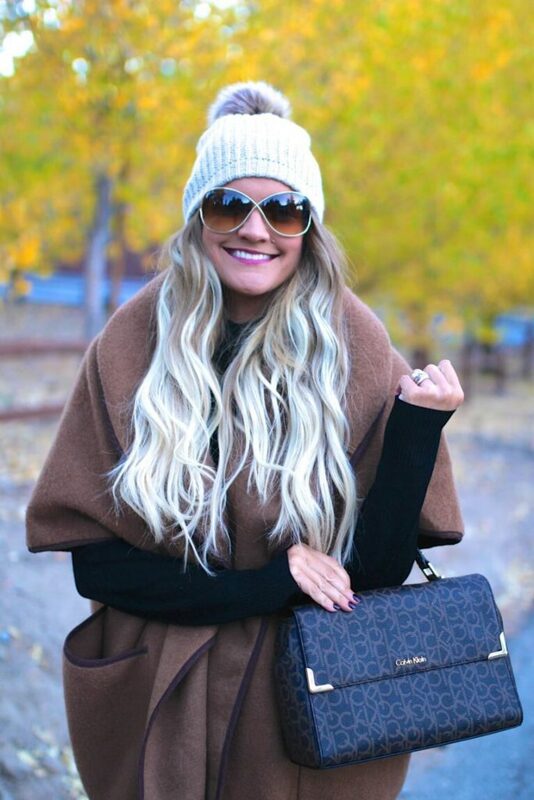 Love this fall look — you look so cozy!! The perfect Autumn look babe!! So beautiful!! The coat is extra cosy and gorgeous! You seriously need to share a photo of your husband on the blog sometime (or maybe you have and I’ve missed it!). That is really awesome that he earned a purple heart, thank you for his service! I love this coat, it looks so soft and comfortable… and cozy! The perfect combination! I have this same poncho and still love it!! You look so cozy. Happy Veterans Day to your hubby–he deserves to be celebrated! That wrap coat is so amazing. You look great. Nice color. In love with that wrap coat!! It really does look so effortless and the color is just classic! You look so cozy! I love that coat, and what a cute hat. Happy Veteran’s Day to your husband, and please tell him thank you!